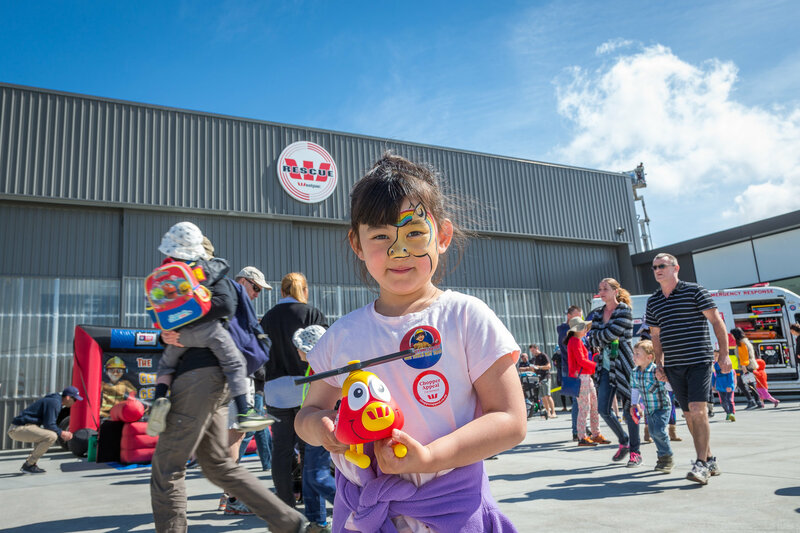 Fun at the Air Rescue & Emergency Services Open Day 2018! October 28th was a magnificent day celebrating the work of Canterbury’s air rescue and emergency services teams. After having to postpone the event earlier this year because of weather, it was a welcome relief to see blue skies on Sunday morning. A huge thanks is owed to our very own Rachael McNutt, who did an amazing job organising the event. The day started off with a bang! First on the agenda was a demonstration from the Airport Fire Service team, who showcased the capabilities of one of their Rosenbauer Panther CA5 fire fighting vehicles. The water display delighted (and saturated) the crowd. Next up was a stellar brass band performance by Nor-West Brass. One of the band’s members was rescued by the Westpac Rescue Helicopter in 2017, after a motorbike accident in Arthurs Pass. The NZ Police Dog Section and Armed Offenders Squad, along with our very own Westpac Helicopter Crew, coordinated an offender take down in the early afternoon. This involved the helicopter flying into the scene, with a police dog and its handler being winched down to the ground, before the ‘bad guy’ was subdued and taken into police custody. This demonstration is always a highlight of the day, and showcases the skills and bravery of our emergency services teams who work tirelessly to keep our communities safe. We encourage you to go like our Facebook page and have a look around: https://www.facebook.com/CWCairrescue/. Here you will find a great selection of photos and videos from Open Day, as well as posts featuring our awesome community supporters and other Trust events. Check it out and keep up to date with news and events from the Air Rescue team. Thank you to everyone who attended or supported this year’s Open Day – it was wonderful to see so many people enjoying the day. And finally, a HUGE thank you to GCH Aviation and all our emergency services partners for being part of the day…we couldn’t have done it without you. The amazing work you do in our community is greatly appreciated. Sign up to our newsletter to get all the latest on our team, events, and campaigns.